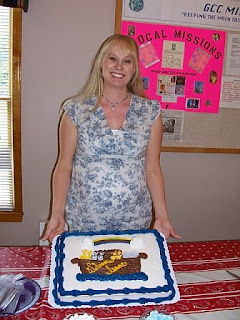 Knit By God's Hand: Baby Shower Day! What fun it was! It was good to see all the work come together & have everyone have a good time, & celebrate this coming baby. Friends & family all together - laughing & enjoying each other - is there anything better than that? My only regret - I was so busy running games, making sure food was OK - cutting cake - I didn't get to take many pictures - & I'm a HUGE picture-taker! Darn it! But I did get a few & I'll post at least a picture of the new mommy when I get them downloaded! Now - I feel sorta lost without an event to plan. That's alright though - I'm sure something will come up soon enough! On a side note - you have to click on the side on "Chad" & look at his latest posting "EVERYTHING" - that video is just so moving! It reminds me of the skits of "One Time Blind" from "Believe" - the Jr. High Conference. Sometimes, the simpliest forms of art holds the biggest impact of a message. I have teared up every time I see this video - its wonderful! Hooray for baby Isaac!!! Again, I'm so sorry I couldn't be there. I miss you guys all the time, and hope we'll all get to hang out again someday soon.